World wheat prices ended mixed in the first full session following the USDA’s Feb WASDE release. European futures closed lower amid lagging exports. Black Sea cash prices lost another $2/MT after hitting new multi-year highs in early February. The Russian market may have peaked, with seasonal trends neutral into spring. 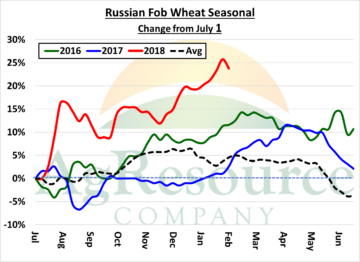 The Russian gov’t maintains an export forecast of 37 MMTs, on par with USDA, and won’t move to control exports until at least March. US exporters sold wheat to Nigeria and Egypt. Russian and German fob offers are equivalent to $5.20-5.40, basis March KC. And May Chicago’s premium to March has fallen to just 2 cents. July CME’s premium to May is also just 2 cents. The Feb WASDE lacked the bullish spark needed to produce massive short covering, but it remains that US wheat is cheap at current prices. Downside risk in world cash values is limited amid ongoing strong domestic demand and record domestic wheat/ flour prices in Russia. Large US export sales are anticipated in coming weeks. Favorable N Hemisphere spring weather is still required to turn bearish beyond the current US market correction.